A smart scan is a targeted scan of critical areas of your computer which are highly prone to attack by malware. These include system memory, auto-run entries, hidden services, boot sectors, critical registry keys, and important operating system files/folders. These areas are responsible for the stability of your computer so keeping them clean is essential. 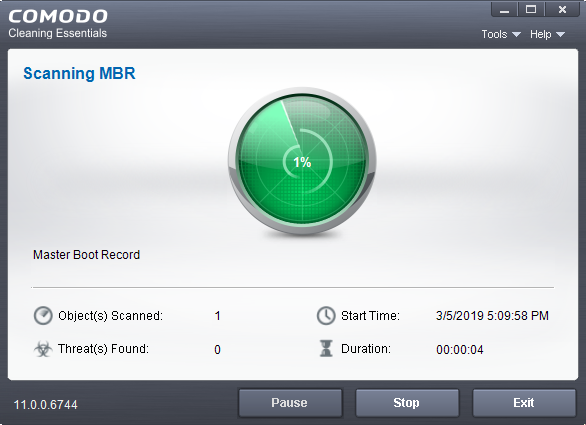 Your computer will be restarted during a smart scan so that Comodo Cleaning Essential can search for hidden services and drivers. Hidden services/drivers are threats which are designed to evade regular antivirus scans. These include rootkits and advanced persistent threats. These attacks run silently in the background and can enable hackers to steal your identity and confidential information like credit card details. Clean the detected threats, or move them to quarantine. We advise you always let the application update itself so you are protected against the very latest threats. Click 'Skip' if you don't want to download the update at this time. Click the 'Threat(s) Found' link at any time to view more details about the malware discovered on your system. Full results are shown at the end of the scan. Clean - The file will be deleted or moved to quarantine. You can later delete the file from quarantine if required. See Manage Quarantined Items for more details. Ignore	- CCE will take no action on the file. Note - the file will be caught by the next scan you run. 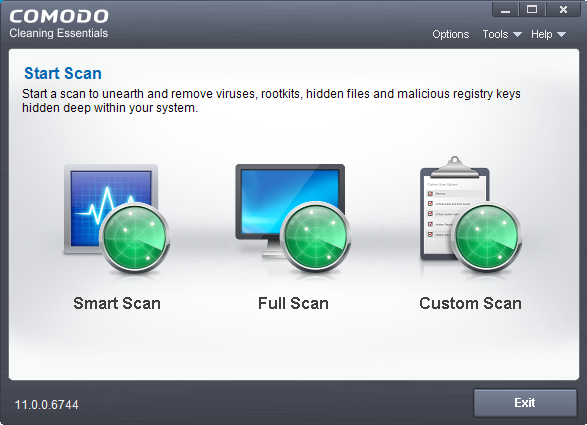 Report	- Submit the file as a false-positive to Comodo. Do this if you think the file is safe, and CCE was incorrect to flag it as malicious. The file will be analyzed by Comodo technicians. Click on the 'Operations >' column header to apply one action to all files in the list. Click 'Apply' to implement your actions. Save all your work first, then click 'Yes' to restart your computer. If you plan to apply the operations at a later time, click 'No'. The clean operations will be implemented the next time you restart your computer.